This vegan tzatziki sauce is a versatile Mediterranean rock star! Kebob? Yep. Pita? You bet. Falafels? Absolutely! It even goes great on salads or Mediterranean buddha bowls! 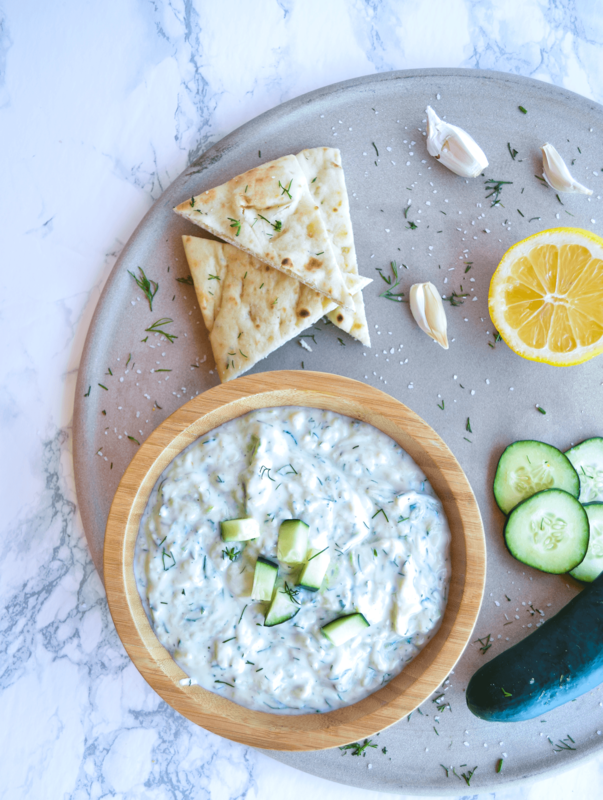 The best part is this vegan tzatziki only uses 6 ingredients and is ready in just a few steps. For the base I use a soy yogurt but feel free to substitute your favorite dairy free yogurt. You could even use homemade cashew mayo as the base. The only real prep work for this tzatziki recipe is to grate the cucumber. The cucumber should be finely grated so that it gives your tzatziki a chunkier texture while still having a saucy consistency. Your definitely going to want to use your favorite food processor for this step because hand grating the cucumber would take forever. Just insert the grating or shredding disc into the food processor and feed the cucumber through. Once you’ve grated the cucumber, wrap it in paper towels to absorb any excess liquid. This step is extremely important for achieving the proper consistency in your tzatziki sauce. If you don’t properly drain the cucumber the sauce will be too runny and won’t combine well with the grated cucumber. Allow the cucumber to drain for about 15 minutes while you prepare the remaining ingredients. Zest the lemon and remove the stems from your fresh dill. Lastly, stir together all the ingredients until well mixed. Yup that’s it. It’s that easy. Grab some pita or Naan bread and dip away! If your sauce is too thick for your liking you can slowly add some olive oil or more lemon juice until you reach your desired consistency. Alternatively, if you find the sauce too thin, let it chill in the refrigerator for around 30 mins until thickened. Mediterranean food is something I could eat everyday. It just never gets old for me. Not to mention a Mediterranean diet is seriously healthy and great for your heart. If you liked this vegan tzatziki sauce recipe then you’ll definitely love my pink beet hummus. It’s another Mediterranean classic with a modern twist! This dairy-free tzatziki is a vegan take on the classic Mediterranean favorite. Fresh, tangy, garlicky goodness. Perfect for dipping or drizzling on any Mediterranean recipe! I loved this vegan Tzatziki sauce. Served it with veggies and pita and it was good! Thanks Stacy, I’m glad you enjoyed it!